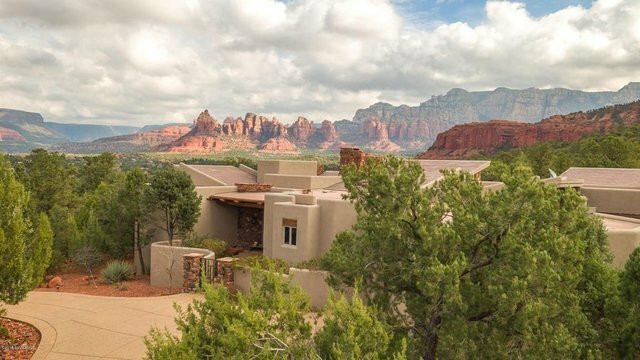 Find contentment and inspiration among the Sedona Red Rocks in this architecturally stunning residence adjoining the National Forest in the shadows of Elephant Rock. Architect, Paul Overman, created this beautiful masterpiece with custom red rock, cobble, and river rock stonework flowing throughout the home. Take in the astounding views from the grand living room, dining room, and kitchen; all with an open flow among living spaces. Built by Doug Howland, this gorgeous home features 18ft high ceilings, custom cabinetry, solid white oak floors, a generously sized office with custom built-in bookshelves, and special touches around every corner.